나의 작업은 자작시(自作詩)를 통한 다원적 융합과 현대동양화의 변용이다. 단순히 규명할 수 없는 인간의 존재와 시공간의 덧없음에 대한 회한(悔恨)을 낙관적 은유와 상징의 동양정신으로 드러낸다. 이는 현대미술의 차원에서 공감각(共感覺, synesthesia)과 다중매체를 통해 독창적으로 구현된다. My work is multi-dimensional coalescence by self-written poem and variation of modern oriental paintings. It represents the sorrow and regret about the emptiness of human being and time and space that cannot be defined simply through positive metaphor and oriental philosophy. This is realized synesthesia and multimedia on the dimension of modern art. 1. 작품 <천지꽃 天地花Flower World>은 문자, 언어, 도상의 시詩적이고 다원적인 융합과 변용이다. 시서화詩書畵, 서화일체書畵一體, 지필묵紙筆墨, 오방색五方色(색동色動 Saekdong: stripes of many colors), 몰골법沒骨法의 전통 위에 현대의 색과 꽃의 도상이 융합되어있다. 화려한 형광컬러는 전통색에 기반한 모니터 색에서 변용되었고 모필의 사용과 함께 충만한 영혼과 에너지, 다채로운 화려함으로 삶의 활기를 표현한다. 2. 천天, 지地, 꽃의 세 글자는 작품에서 시어詩語가 된다. 각각 하나의 작품이며 세 글자가 하나가 되어 세 작품이 하나의 연작이다. 한자어 <천지天地>는 음과 양의 또 다른 의미로, ‘온 세상’을 말한다. 한글 <꽃>은 최근 작품에 주로 등장하는 <색동꽃 Saekdong Flower>의 문자적 모태이다. 또한 색동꽃은 각각의 색을 가진 여러 꽃잎이 모여‘한 송이’꽃을 이룬다. 작업의 특성인‘융합’의 상징적 도상이다. 아울러 한자어와 한글의 융합은 동양에 있어서 중국과 한국이 공유하는 문자문화를 나타낸다. 이로써 작품의 <천지天地>와 <꽃>은 동일한 의미를 갖는다. 이를 통해 상대적인 대상, 대상과 다른 대상, 그리고 여러 대상들이 자신을 지켜내면서도 서로 하나가 될 수 있는 원융무애圓融無?의 사유를 공감각적으로 표현하고자 했다. 나는 내 작업이 동서고금을 그물처럼 연결하는 여러 겹의 꽃 한 송이가 되기를 바란다. 1. 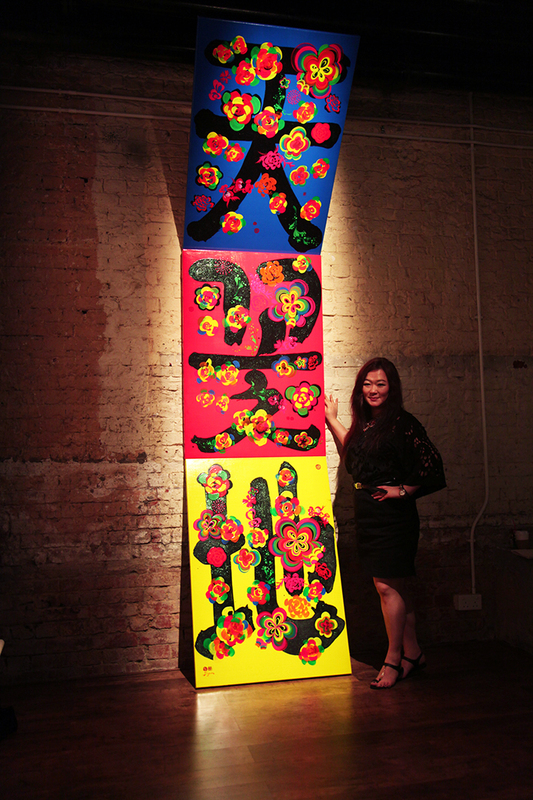 The work <天地花Flower World> is poetic and multi-dimensional coalescence and variation of letters, languages, and figures. 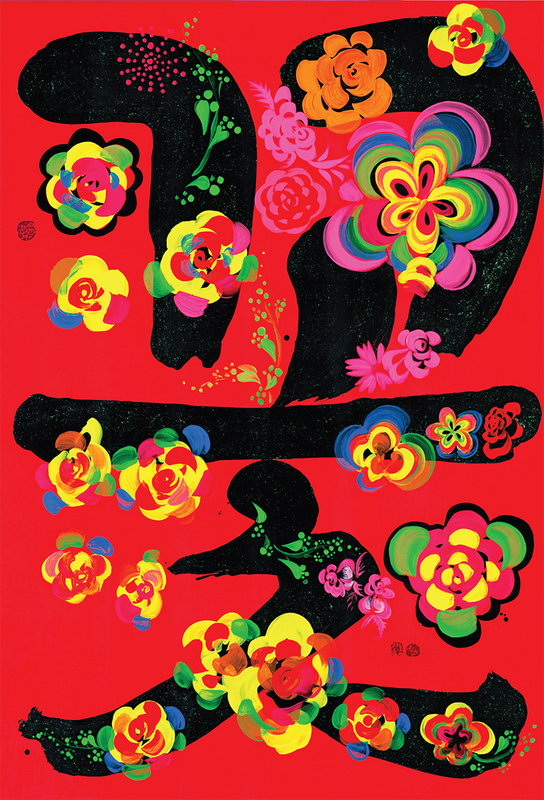 On the tradition of Poem-painting, paintings and calligraphic, brushes and ink, and Saekdong(stripes of many colors), and Molgol technique, the modern color and figure of flowers are integrated. 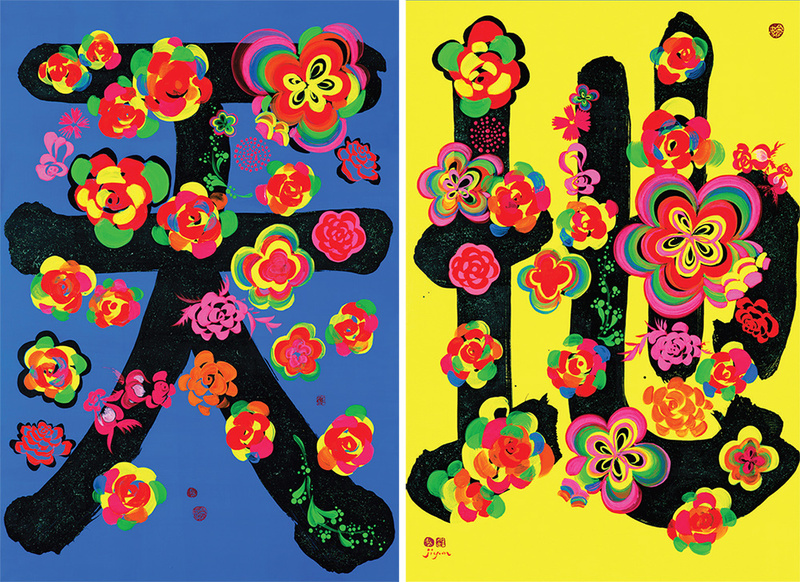 The vivid color is varied from monitor color based on traditional colors, representing the rich soul and energy by using a writing brush, and vitality of life by colorful splendidness. 2. Sky天, Earth地, Flower. These three letters become a poetic form in the work. They themselves are one artwork each and all together become a series. The Chinese character <Sky and Earth 天地> is another term of yin and yang, which means the ‘whole world’. 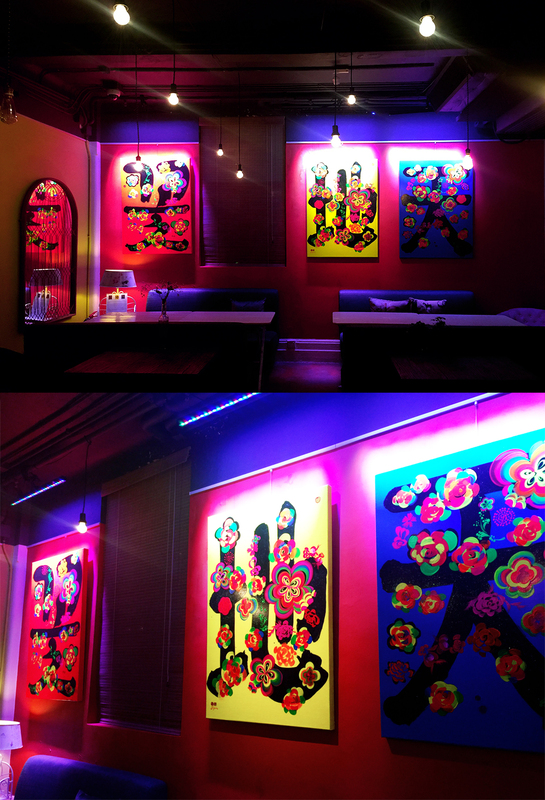 The Korean letter <꽃 Flower> is the literal matrix of <Saekdong Flower> represented in recent works. Moreover, Saekdong Flower comprises ‘one flower’ with many leaves that have different colors. It is the symbolic figure of ‘coalescence’, the characteristic of this work. The integration of Chinese characters and Korean represent the literal culture China and Korea share. Therefore, the work <Sky and Earth 天地> and <Flower> have the same meaning. With these works, I tried to describe the ideal coalescence(圓融無? ), which means that relative objects, object and the other, and many object can keep themselves while becoming one, in synesthesia. I hope my works can become one flower with many leaves that connects all ages and countries like a net.